Charlotte is now the research correspondent for the ME Association. She writes the popular research summaries for our website and has a canny knack of explaining findings from the latest research in a way that even I can understand. She has kindly taken the time to explain why our Christmas Appeal for More Research for M.E. in 2019 is so important. 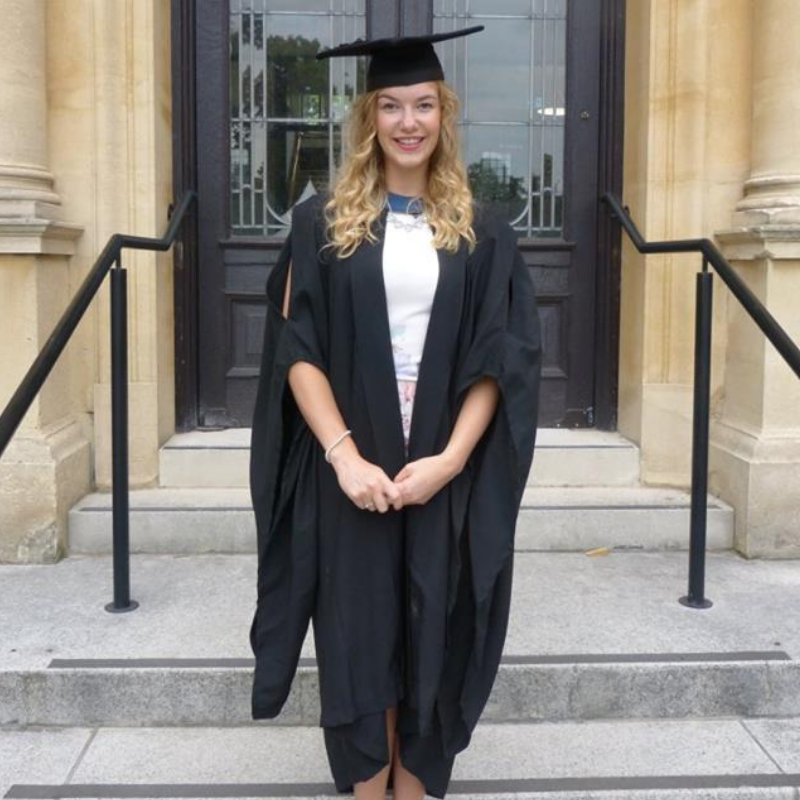 Charlotte Stephens graduating with a first in biochemistry. Charlotte is 23 and has a first-class degree in Biochemistry from the University of Reading. She now lives in Cornwall with her parents and her cat, Tibby. 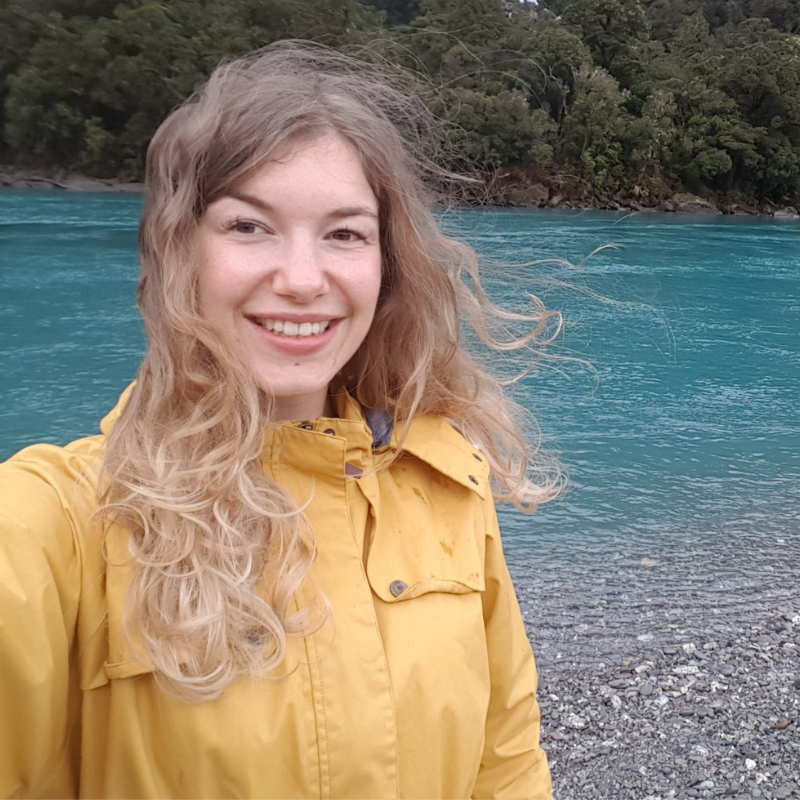 Living back at home and translating research papers wasn’t exactly the life she had dreamed of. 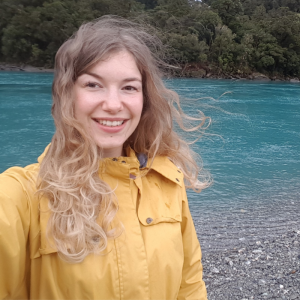 Charlotte had wanted to finish her degree then take a year out to travel (and run a half marathon) before fulfilling her dream of passing her PGCE to become a science teacher. But that all changed because of M.E. Now she hopes to one day recover enough to hold down a part-time job in M.E. research, working on finding causes and effective treatments. We sincerely hope that she can achieve this ambition. She would make a terrific addition to any M.E. research team. In the meantime, Charlotte wanted to pass on her reasons for supporting the Ramsay Research Fund Christmas Appeal and why she thinks it is so important that we fund more research in 2019. Charlotte was a model student. She was a high achiever academically but managed her time so meticulously that she was able to fund her studies through waitress work. She also found time for sports and hobbies, volunteering (with St Johns Ambulance), and to have an active social life. She was very physically active (netball, swimming, running, and weekly gym classes including Zumba) and also a gifted musician having been voted ‘most likely to make it in the music industry’ at college. At University, she was part of a songwriter’s group, sang in a choir and did regular open mic nights, as well as being part of the drama society. The central index of published M.E. research that Charlotte now helps maintain. Towards the end of her term at University, Charlotte fell ill with glandular fever and, like so many others, never fully recovered. She was later diagnosed with M.E. 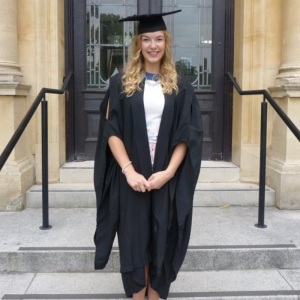 Thanks to the sterling support she received from her tutors, she still managed to graduate with first class honours from Reading University but the effort to finish proved too much for her health. She crashed badly – so badly that waitressing, sport and even music had to be given up as just 3 minutes of piano playing would leave her in pain for hours. Charlotte also lost many of her friends as they found it difficult to understand her illness and she struggled to keep up with any social activities. Charlotte is focused entirely now on recovery. For the past two years, she has been trying various treatments, both conventional and alternative. She made some small improvements and, with the support of a most understanding boyfriend, has even managed to travel a little. She is not yet well enough to hold down a part-time job, but she is just about managing to volunteer in a local school for 1 hour each week. I have often heard the ME Association being referred to as a lifeline – our aim being to support people with M.E. and that is exactly what we try to do. Charlotte admits that her M.E. had left her feeling ‘useless’ and with no ‘sense of purpose’. “I spoke with our trustees and then I phoned Charlotte for a chat. She started last year as a volunteer but we were soon able to give her more work which she took to very well. “Working for the ME Association is amazing as they completely understand my illness, that I have good and bad days, and that sometimes things may take a little longer to complete. She told me that she has thoroughly enjoyed studying the ME Association’s Clinical and Research Guide (The ‘Purple Book’) and getting to grips with all the research and theories around M.E. It gave her a better understanding of her own illness. She also found our downloadable leaflets on various aspects of M.E. (most written by Dr Charles Shepherd) very useful as her own doctor struggles to answer her queries and it isn’t easy trying to find clear and reliable information. Charlotte now updates our monthly release of research abstracts and the central research listing, writes conference reports and has provided much of the content for our new research-related leaflets (to be released shortly). 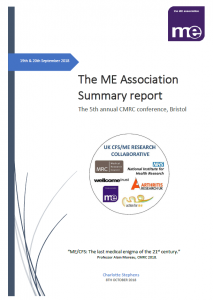 The 2018 CMRC Research Conference Report by Charlotte. “The CMRC conference was so inspiring and encouraging – particularly seeing the researchers all talking together, brainstorming and bouncing off of each other’s ideas. “That’s what we need more of. There is so much research going on in so many different areas that we urgently need more collaboration to bring things together. “It was also great to see some GP’s attending the conference, taking an interest in M.E. research. “One of this year’s highlights was a talk by Dr Nina Muirhead. She has M.E. and is trying very hard to get the disease into medical school curriculums. “It is so frustrating that doctors are currently not taught about M.E. in their training. The main source of information they have is the NICE guideline, which is over 10 years old, unfit for purpose and currently the subject of a major review. “It was also very inspiring to see so many young researchers presenting, and I hope to one day be well enough to do that myself! “It has become clear that there are several subgroups of patients within the ‘ME/CFS umbrella’, who have different disease pathologies and will therefore require different treatments; I don’t think there will be a ‘one size fits all’ cure. 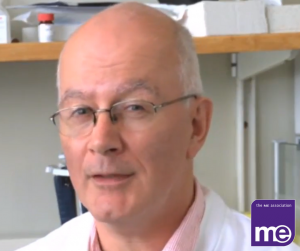 The Ramsay Research Fund is supporting Dr Karl Morten and his team at Oxford University. “Therefore, more research needs to be done into identifying these subgroups and studying them separately as I think this is having a negative effect on current research results. “The developments in metabolomics are very promising, with recent preliminary results presented at the CMRC conference suggesting a defect in glucose metabolism. “I look forward to reading the published results from Dr Karl Morten’s study, which has been supported by the ME Association Ramsay Research Fund. “I’m also excited for the recent negative Rituximab trial to be published. I have some theories as to why it may not have worked and still hold hope for it to be a therapeutic drug for a subset of patients in the future. “Unfortunately, one of the biggest drawbacks for M.E. research is funding. Although some high-quality biomedical research is being carried out, it is on such a small scale that it is hard to draw any solid conclusions. Thank you all for your support. And thank you Charlotte for your thoughts. We do indeed share her hope that research will help thousands of people achieve a better quality of life. There’s still so much more to do, but we won’t stop until a cure is found!